There's just something about this image that makes me go all Freudian. I'm not sure what it is. 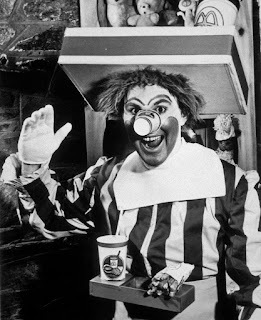 Speaking of McDonald's, this highly disturbing extra bonus is brought to us by the president of the Willard Scott Fan Club, Debbie Mix. It's an image of the very first Ronald McDonald from 1963, ol' Willard himself. Thank you, Debbie, for bringing terror into my life. The .at suffix is for Austria, not Australia (which is .au). One has kangaroos, one has...bun-suckling infants, apparently. Hey, maybe that's what made you go all Freudian!